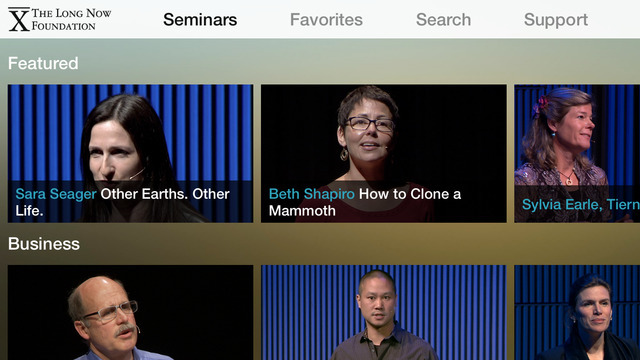 The Long Now Foundation is making its video archive of the Seminars About Long-Term Thinking (SALT) freely available on its website and on the new Apple apps, allowing people to stream the SALT Seminars on Apple TV and their iOS devices. The free iOS apps feature videos of The Long Now Foundation’s latest Seminars, including those by author and Nobel prize winner Daniel Kahneman; author Neil Gaiman; English composer and record producer Brian Eno; oceanographer Sylvia Earle; biotechnologist, biochemist and geneticist, Craig Venter; WIRED’s founding executive editor Kevin Kelly; author and MacArthur Fellow Elaine Pagels; Zappos CEO Tony Hsieh; biologist Edward O. Wilson; author and food activist Michael Pollan; and psychologist Dr. Walter Mischel, creator of The Marshmallow Test. The Long Now Foundation Seminars, which are hosted by Stewart Brand, are online and available in the iTunes store as as free app and audio podcast. The iOS app initially launched with 50 Seminars with new videos added monthly as part of the Foundation’s ongoing lecture series. The Seminars are free to watch, and are made available through the generous donations of the members and sponsors of The Long Now Foundation. Membership begins at $96 per year, and includes free tickets to the monthly Seminars held at the SFJAZZ Center in San Francisco, as well as a quarterly newsletter, free and discounted tickets to partner events amongst other member offerings. The Seminar media is created in association with Shoulder High Productions, a full circle media company and with FORA.tv, a San Francisco-based video production and marketing company.